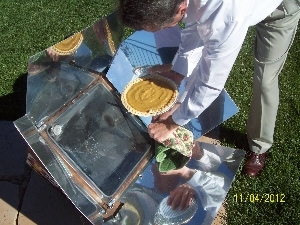 Every year, just a day or two after Halloween, we cut up the pumpkins and put them into several large pans and cook them up in the Solar Ovens. We have so much pumpkin that we decided we would bottle some of it. I can't stand the thought of so much pumpkin every year being thrown away without even a thought about how it could be utilized for something better, such as pies or filling for other dishes. With this fresh cut pumpkin we decided to make some, from scratch, Solar Cooked Pumpkin Pie. Since our pumpkins are carved only a day or two before Halloween they do not spoil or rot too quickly because of the cold nights. If they had been carved earlier they would not have made it to Halloween, much less after, since our days are quite warm down here in the desert southwest of Southern Utah. 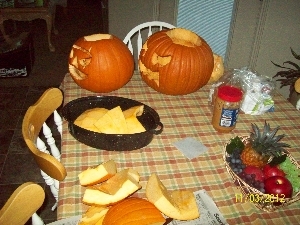 I can usually utilize the majority of the pumpkin, having to cut or scrape off only small bits that may have started to go bad. I put the large slices of pumpkin, peeled and washed, into the covered roaster pans with some water and then I let them cook in our Sun Oven, Sport Oven and Suncook for about two hours or until the pieces are soft and mushy. 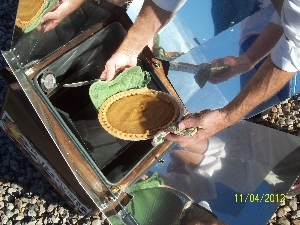 Pumpkin cooks up very well in a solar cooker. I took the soft cooked pumpkin and placed several large pieces into our Bosch Kitchen Mixer with the mixing whisks and turned it on, gradually reaching the highest speed, whipping it for about fifteen seconds until it had formed a lumpy mush. 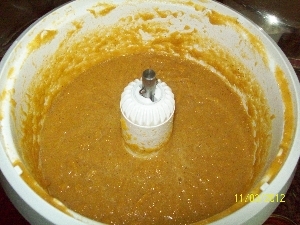 I then commenced to add the ingredients I had found online for a recipe for Home made (from scratch) pumpkin pie. Because my ingredient quantities were different from the recipe I put in the quantities that I felt were adequate. * While I was mixing this together I had placed my pie crust (homemade, or pre formed) into a preheated (325-350 F) Solar Cooker to give it about 20 minutes to brown,cook and set up before adding in my wet pie filling. Pour the mixture into the pre cooked pie crust and place back into the pre heated solar cooker. Allow for about one and a half hours to cook. Set your timer for about 30 minutes each time in order to remind yourself to check on and re focus the cooking pie. This will assure higher optimum temperatures. Check the pie after an hour and a half for doneness by insterting a knife in the middle to see if it comes out clean. Allow to cool for two hours or more. 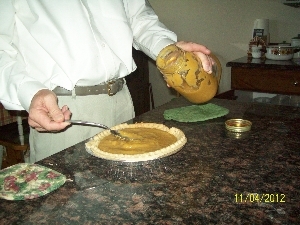 These home made solar cooked Pumpkin Pies usually have a lighter color than the canned filling pies.